LOS ANGELES (AP) — A strange glow in space has provided fresh evidence that all the gold on Earth was forged from ancient collisions of dead stars, researchers reported Wednesday. Astronomers have long known that fusion reactions in the cores of stars create lighter elements such as carbon and oxygen, but such reactions can’t produce heavier elements like gold. Instead, it was long thought that gold was created in a type of stellar explosion known as a supernova. But that doesn’t fully explain the amount of the precious metal in the solar system. About a decade ago, a team from Europe using supercomputers suggested that gold, platinum and other heavy metals could be formed when two exotic stars — neutron stars — crash and merge. Neutron stars are essentially stellar relics — collapsed cores of massive stars. Now telescopes have detected such an explosion, and the observation bolsters the notion that gold in our jewelry was made in such rare and violent collisions long before the birth of the solar system about 4½ billion years ago. People “walk around with a little tiny piece of the universe,” said lead researcher Edo Berger of the Harvard-Smithsonian Center for Astrophysics. NASA’s Swift telescope last month observed a gamma-ray burst that resulted from the crash of dead stars. The burst, in a distant galaxy, was some 3.9 billion light-years away. Each light-year is about 6 trillion miles. The burst lasted only a fraction of a second. Using ground telescopes and the Hubble Space Telescope, Berger’s team noticed an odd glow that lasted for days. Infrared light in the glow could be evidence that heavy elements like gold had spewed out of the cosmic crash, the researchers said. 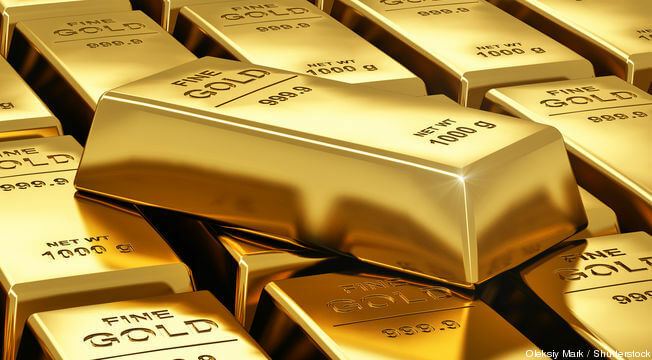 The new work, which will appear in a future issue of Astrophysical Journal Letters, suggests gold was produced in a similar fashion in the Milky Way. It doesn’t delve into how Earth was sprinkled with riches, but previous studies have suggested that a meteor shower may have delivered gold and other precious metals to the planet. If the new study’s interpretation is correct, “this would be truly very exciting news,” said Stockholm University astrophysicist Stephan Rosswog, who led the earlier supercomputing effort but didn’t have a role in the latest study. More observations of gamma-ray bursts are needed, but it’s looking more likely that mergers of neutron stars are “a major cauldron in which elements like gold are forged,” Rosswog said. Such flashes are thought to occur in the Milky Way about once every 100,000 years. Berger said it’s unlikely another will happen in our galaxy in our lifetime. But satellites can often detect such eruptions in distant galaxies about once a month. Were US Astronauts Ordered Not To Report UFOs & Aliens?